Truly an exciting new way to improve the ability of your hands that is both fun and rewarding! Finger Fitness is a series of exercises designed to enhance hand strength, coordination, finger independence and fine motor response. These exercises you can do anywhere, anytime – all you need are your hands! The basic exercises are ideal for use as warm-ups or short breaks in the workplace. The video’s progressive style challenges you to increasingly complex hand exercises with musical and verbal accompaniment. 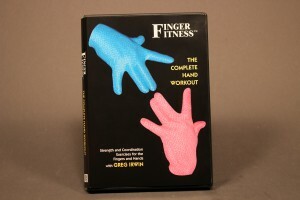 The easy-to-follow format is highly recommended for anyone just starting the Finger Fitness program. Part A includes Warm-Ups, three lessons and five dances to reinforce the lessons you have learned. It is followed by an extended dance section with music only and no instruction that is suggested once you know the routines. Part B includes two lessons and five dances, again to reinforce the lessons you have learned. It is also followed by an extended dance section with music only and no instruction that is suggested once the routines are familiar. A free insert included that covers a Handy Table of Contents and pictures of the six Basic Moves. And this approach to hand conditioning is a powerful tool for boosting performance and strength in specialized applications, such as playing a musical instrument, typing on a computer or carrying out a delicate surgical procedure. Introduction from Meg Robinson, Certified Hand Therapist.